Welcome to part II of our series of Great Eskape Racing's "better know a sponsor" featuring Zeke's Coffee DC. Great Eskape has been fueling up on Zeke's coffee for the last 2.5 seasons but this year brought our friendship to new levels with the introduction of the bi-weekly "Coffee Outside" rides hosted by Conte's Bikeshop, Greateskape.com, and Zeke's Coffee DC. Since early spring we have been gathering friends new and old at the Georgetown Capital Crescent trailhead, riding a mixed surface route out to the Great Eskape "clubhouse" off the C&O canal trail, and enjoying freshly camp-stove-brewed Zeke's coffee by the riverside. We will sometimes show up with some fresh cold brew on hot days, but always have in hand our exclusive custom blend of #Coffeeoutside beans. The story of Great Eskape and Zeke's DC begins with founding team member and modern-day-renaissance man Phill a.k.a 2L. Phill, in addtiion to being a lawyer in training, bike mechanic, and classic bike enthusiast, is a coffee snob. Phill has most surely tried the coffee from every bean roaster in the DMV and isn't shy about his feelings. When we were putting together our initial list of supporters we know we needed to fuel our early race mornings with a local coffee coaster, and we knew Phill would have the answer as to who was best. Will was unequivocal that Zeke's was doing the best work around, located right in D.C. and made the introduction in short order. The rest is history! Speaking of history, Zeke's DC is family-owned and operated company founded in Baltimore, Maryland in 2005, they opened the DC iteration in November 2013. Zeke's DC is a true small batch roaster. 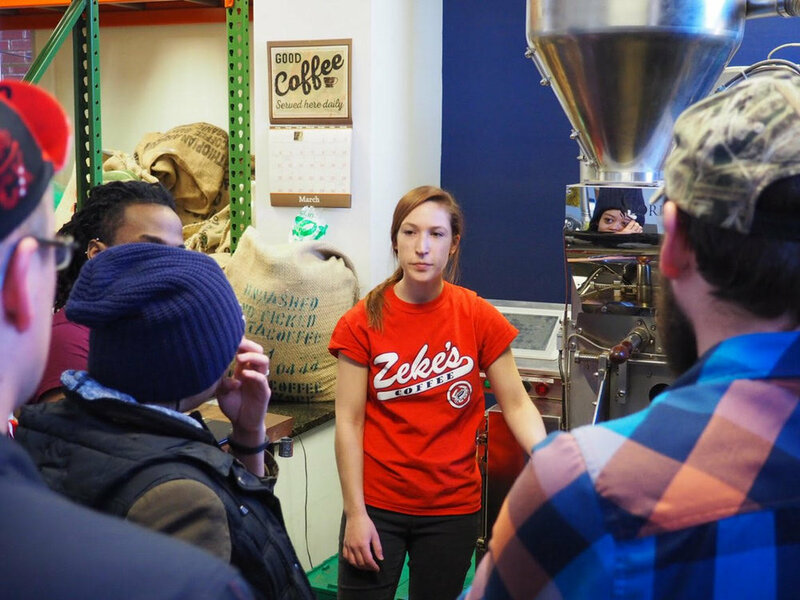 Zeke's roasts in 12 pound batches, as opposed to the 150 pounds that a standard roaster holds. While this means it takes more time and more labor, it's a difference you can taste. The Great Eskape #Coffeeoutside blend is born! Zeke's roasts with what's called a fluid bed coffee roaster that uses hot air to create a fountain of coffee beans. This technique leads to cleaner tasting coffee with more distinct regional flavors. The GE #Coffeeoutside blend is a celebration of our hometown of Washington, D.C., combining beans from two of the countries who have contributed the most to D.C.'s unique culture: El Salvador and Ethiopia. Come join us every other week for Coffee Outside on Friday mornings to check out our unique blend and kick your weekend off with good times and good people. Warm sunny day and hot coffee!